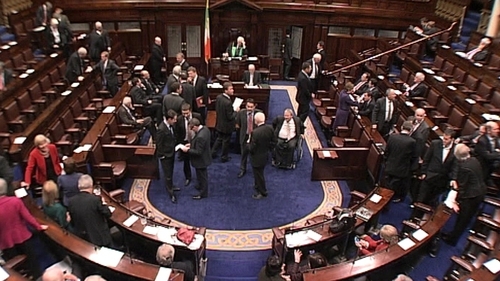 The Dáil has passed all stages of the Social Welfare Bill, giving effect to the welfare cuts announced in the Budget. The Bill, which reduces most welfare payments by around €8 per week, was passed by 80 votes to 76. A spokesperson for the Department of Social Protection has said that the Social Welfare Bill is scheduled to go before the Seanad next week. It is expected to become law before Christmas and this would allow changes to rates of payment to come into effect on 1 January 2011. Fine Gael's Michael Ring had called on deputies supporting the Government to vote with their conscience, and reject cuts to payments for blind people, widows, carers, and people with disabilities. The State pension may have escaped Budget cuts, but other social welfare rates are being reduced by an average of 4% - or around €8 a week. Opening the debate on the Social Welfare Bill in the Dáil last night, Minister for Social Protection Éamon Ó Cuív signalled major changes too in disability benefit, with different levels of payment to be introduced for different levels of disability. Labour's Roisin Shortall said Independent TDs voting for the cuts had 'taken the 30 pieces of silver'. Ms Shortall called on Jackie Healy-Rae to give back the €10,000 per year he receives for chairing the Oireachtas Committee on Social Protection. Sinn Féin's Caoimhghín Ó Caoláin had said that the Government was trying to ram through the Social Welfare Bill, which would place the most vulnerable in an impossible situation. Tánaiste Mary Coughlan defended the Government's record, saying that it had trebled the amount spent on social welfare expenditure. Green Party TD Paul Gogarty said Ireland has to pass the Budget and take the IMF/EU bailout, although he conceded that we were bullied by our European colleagues into taking it. He said he would be voting for the Social Welfare Bill, but that he would make a plea to the Minister that some changes would be allowed in the amendments. After the Dáil finishes debating the Social Welfare Bill, it will move on to the Financial Emergency Measures Bill. That Bill will cut public service pensions, reduce the minimum wage by €1 per hour and cut the salaries of the Taoiseach, the Tánaiste and Ministers. Meanwhile, Labour leader Eamon Gilmore asked Ms Coughlan to tell the Dáil when the Government would be brought to a conclusion and a General Election called. The Tánaiste said that the date of the election would be decided after post-Budget measures had been addressed in the House. Green Party Chairman Senator Dan Boyle has rejected reports that the General Election may be delayed to allow the passage of several pieces of legislation such as the Climate Change Bill, the ban on corporate donations and the directly elected Mayor of Dublin. Mr Boyle said that party leader John Gormley had announced that after the passage of the Finance Bill by the Dáil and Seanad the party would not remain in Government. He said that was clear and precise. Elsewhere, Fianna Fáil TD Seán Ardagh, who has represented Dublin South Central since 1997, has announced he will not be contesting the General Election. Earlier, the Taoiseach paid tribute to Deputy Tom Kitt at the Fianna Fáil Parliamentary Party meeting. The Taoiseach thanked Tom Kitt for his efforts for Fianna Fáil over the years. He said that the party would greatly miss Tom's valued contribution and his abilities but he respected Mr Kitt's decision not to seek re-election.